As our group was a bit early (the ship had gone out for a few hours science) we were offered a half hour ride in one of the zodiacs out into the iceberg-infested bay. What followed was equivalent to a ride through someone else’s mind. We were in Somewhere Elseland. I don’t know what’s allowed and what’s not but we in our tiny rubber zodiac seemed so close among these giant bergs, we were almost inside them. You could hear them breathe, their internal cities seething and planning. Blue shots of glass striking eerie meridians through the toothpaste white. The water black with cunning. I thought: this is so binary. You’re either alive in the boat or dead in the water. There’s no grey area here. Over the side and over the top. No-one knew exactly where we were except these watching bergs. The Russian at the helm was smiling with one side of his mouth only. I looked at Martha, who looked at me. We looked at Vicky. Vanessa smiled a bit. We asked if we could perhaps not be quite so close, you know, in case a chunk fell off for instance. 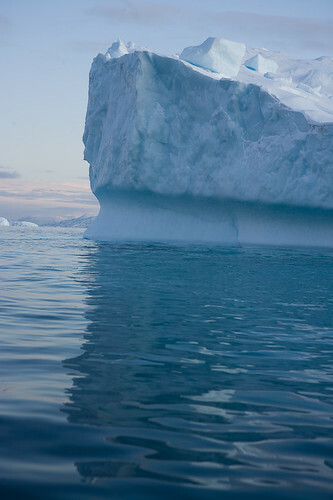 He pulled away and on cue a building size section of ice collapsed into the sea pretty much where we’d just been. Quite probably loosed by our small motor. Bloody humans. Can’t live with them, can’t shoot ‘em. I think we’re investigating the environment through our ridiculous human selves. I think we need to keep looking out, stand on deck, be where we are. We need to think colossally silly and lateral thoughts in order to address the equally monumental change that we all have to make. Regardless of climate change, the wasteful squandering of fossil fuels is plain stoopid. Even back in the 70’s I remember school campaigns to save electricity, water, coal, everything. Waste was selfish and pointless. Somewhere after that time it became OK to be wasteful: part of an affluence that was our right, our proud fingerprint. And then our footprint. The solution seems so easy I still can’t quite understand the confusion. We just need to use less energy. We need to be more efficient. We save money that way, and incidentally the environment. How did it get so difficult, so political, so divisive, so derided? What’s the controversy? Cape Farewell is about using art and science and their cross-pollination as a filter for these ideas that have become so politically hijacked that half the population feel alienated by them and the other half feel there’s no point as it’s all lost already. That’s it. No remit beyond that and the gestation of these individual and collaborative works may take a while as there’s a lot to digest here. But it may be more useful to do things this way than hectoring lecturing campaigning which can be a dangerous turn-off. Who knows? Last night in Uummannaq, after our musicians played a blinder of a gig to a baffled local audience in a bar, we wondered out into the silent glory of Northern Lights. They are like thoughts, planetary speech bubbles. We stare up from the frozen -10C deck and sip bourbon from my flask, trying to decode them. … and on we partied. Hey Min, Have so enjoyed reading your posts and following generally what’s been going on out there with all you creatives-a-plenty. Wishing you all a safe passage homeward. ‘The Yellow Submarined’ or more obviously ‘The Yellow Submarine’. ‘Be seeing you’ as Patrick Mcgoohan used to say.